Dakota Lodge in Keystone Colorado Real Estate are one of several condo complexes in River Run. Built in 1997 there are 67 units comprised of 1 – studio, 28 – one bedrooms, 37 – two bedrooms and 1 – three bedroom condo. Dakota Lodge condos have a plethora of on-site amenities which include an outdoor heated pool, outdoor hot tubs, sauna , underground parking and a small lobby with fireplace. 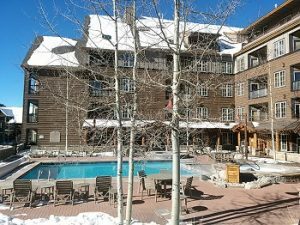 Being located in River Run and less than 200 yards from the Keystone Ski Resort Gondola makes Dakota Lodge prime for owners and renters. These River Run condos in Keystone are also located across the street from the Dercum Ice Skating Rink which becomes a Putt-Putt Golf Course in the summer. When looking at Keystone Real Estate, complexes in River Run are a great option especially Dakota Lodge with their exceptional amenities.